SAINT PAUL, Minnesota — September 26, 2013 — Minnesotans will now be able to apply online to register to vote, or update their existing registration, thanks to an application developed by the Office of the Minnesota Secretary of State and accessed at mnvotes.org. The online process will deliver convenience to voters, reduce errors in voter rosters, and deliver significant cost- and time-savings for local election officials. “Today we join many states that have already demonstrated that online registration is secure and that it saves taxpayers money,” says Minnesota Secretary of State Mark Ritchie. In addition to launching online voter registration during National Voter Registration Month, the office is making absentee ballot applications available online for military and overseas voters. This will allow those voters to apply for an absentee ballot quickly and easily without the need to print, scan forms, and return by mail, fax or email. In the 2012 general election, there were 10,506 absentee ballots successfully cast by military and overseas Minnesota voters. Ritchie noted that applying for voter registration online provides another delivery method for the application but will not replace paper applications, which will still be available. The online tool was built to ensure that only persons providing verifiable identification numbers will be able to register, and online applications will go through the same verification process as paper registrations. Information provided on the application will be verified with data from the state’s Driver and Vehicle Services or Social Security Administration. County election officials will continue to review applications in the Statewide Voter Registration System and be responsible for approving an application or otherwise. If approved, the applicant will be added to the voter roster, and a postcard will be mailed to the voter to verify their address and provide the location of their polling place. According to Ritchie, online registration will reduce the primary costs of current registration: paper, printing, postage and manual data entry. The Office of the Secretary of State estimates the time required by counties to process an online application will be one-third to one-half of that needed to process a paper application. In addition to reducing the workload and cost of processing registrations, online registration minimizes inaccurate records that arise from processing handwritten paper forms, such as data entry error, illegible handwriting and incomplete forms. More accurate registration rolls will lead to fewer problems and shorter lines on Election Days as voters will have updated and accurate records when they arrive at the polling place. Minnesota is the 15th state to offer online voter registration, joining California, Colorado, Indiana, Kansas, Louisiana, Maryland, Nevada, New York, Oregon, South Carolina, Utah, Virginia and Washington. Arizona first introduced online registration in 2002. Six other states, Connecticut, Delaware, Georgia, Hawaii, Illinois and West Virginia, plan to implement online registration in the near future. According to projections by the Pew Charitable Trusts at least half of the states will employ online registration by 2016. Ritchie encourages Minnesotans to check their registration online to ensure it is up-to-date. In Minnesota, a person must re-register to vote if their address has changed, if they have changed names, or if they have not voted in the previous four years. More than 35 municipalities across the state will hold elections on November 5 for various city officers, and 113 school districts will hold elections for school board members and/or have ballot questions. Eligible voters will be able to register online up until 5 p.m. on October 15. Pre-registration is not required, and eligible voters may register at their polling place on Election Day. 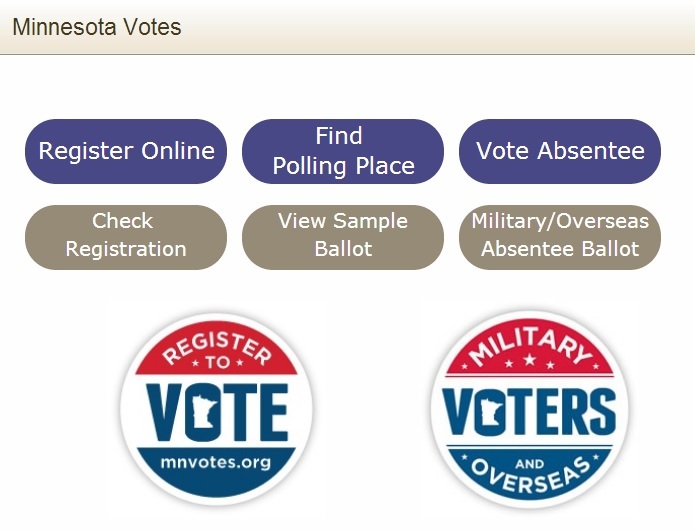 Be the first to comment on "Minnesota Latest State to Offer Online Voter Registration, Online Absentee Application for Military and Overseas Voters"